Creation: VA 167 was created in late 2017 as new construction as part of the I-81 Exit 150 expansion with VA 220 ALT and parallel US 11. Discovered by Thing342. This is the 2nd VA 167. Comment: The main purpose of VA 167 is to get traffic from VA 220 ALT northbound to the ramp to I-81 north. A waste of a number in my opinion...back in the day this would've been a Y route. VA 167 #1: Appeared in July 1933 as a renumbering of VA 511, VA 533, and part of VA 513. It originally ran from the James River at LaSalle Ave to Grand View, utilizing parts of LaSalle Ave, Shell Rd, Back River Rd, Rip Rap Rd, King St, Fox Hill Rd, and Beach Rd. VA 513 out to Grand View. VA 167 out to Grand View. By General Assembly Act in 1940, two changes to VA 167 occurred at the same time: VA 167 was extended west along then-named Monitor Merrimac Memorial Hwy (now part of Chesapeake Ave) to Indian River (near today's Powhatan Pkwy). 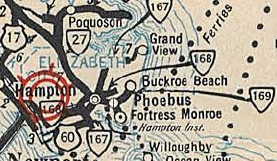 Also, VA 167 east was rerouted along Old Buckroe Rd to end at VA 168 (curr VA 351) near Buckroe Beach, leaving behind SR 616 (later SR 625, now unnumbered) along Beach Rd to Grand View. 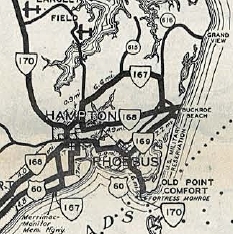 Between 1942-44, VA 167 west was extended to the Newport News city limit. In June 1947 (CTB), VA 167 was extended west along Chesapeake Ave and 16th St. to end at VA 168 Jefferson Ave. In Nov 1957 (CTB), VA 167 was extended up Jefferson from 16th to end at US 60, 25th/26th Sts, replacing a bit of VA 168. In Sept 1961 (CTB), VA 167 was extended up Jefferson to VA 143, 28th/29th Sts replacing US 60 which was rerouted. and extended towards Newport News. VA 167 extended to N News CL. In Oct 1966 (CTB), VA 167 was rerouted in central Hampton to use brand new La Salle Ave to Langley AFB. Rip Rap Rd became unnumbered; King St remained part of VA 278; Old Fox Hill Rd/Buckroe Rd became part of VA 169. In Nov 1995 (CTB), VA 167 was decommissioned to city streets. Oddly, VA 167 still shows up on all VDOT issues through at least the 2016-18 issue and also in Rand McN atlases. VA 167 postings weren't removed from I-64 until about 1999. Field checks since then had found no 167 markers on street level. On some VDOT Officials in the late 60s VA 167 is erroneously shown using Armistead Ave from Mercury Blvd to Sheppard Blvd.